It might be a small, small world, but you can always dream big! 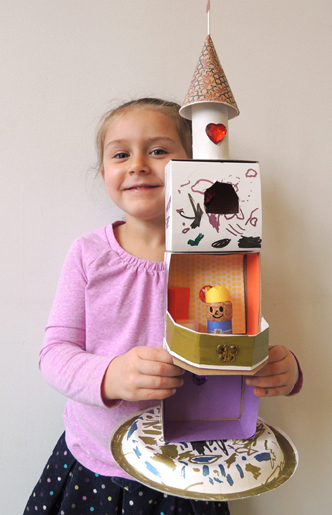 Create a lavish, three-story castle with throne room, balcony, and bedroom with a view. And don’t forget His (or Her) Royal Tinyness, expertly fashioned from a wine cork. We read The Tiny King by Taro Miura (Candlewick Press, 2010). Once there was a Tiny King who lived in a huge castle. He had everything he could want (a big army, enormous feasts, a huge bathtub, a gargantuan horse). But the Tiny King was sad and lonely. Happily, he falls in love with a big princess and marries her. They have ten children who fill their lives with joy, love, and laughter. That huge castle? As it turns out, it was exactly the right size! 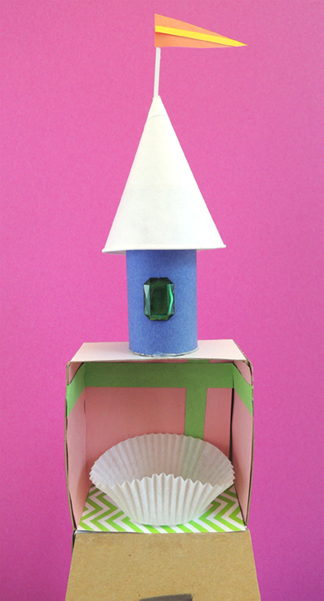 The base of our castle is a flipped over paper plate. 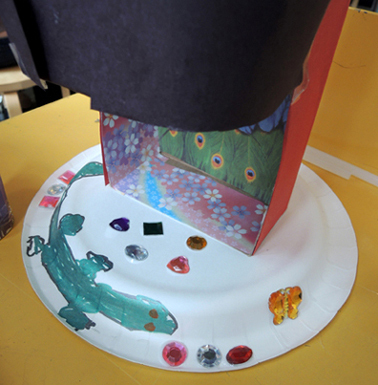 Remove the lid and tabs from the first box, and hot glue it to the paper plate. Add a pair of castle doors if you’d like. Our doors were made out of tagboard – they were simply hot glued in place and didn’t open and shut. 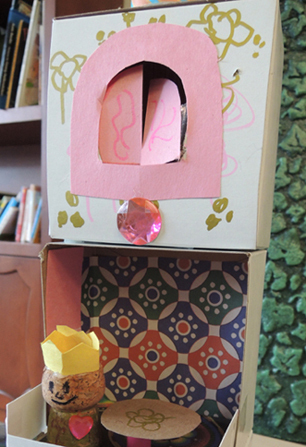 To complete the “throne room,” add a rug (construction paper) and a throne (a tape core with poster board taped to the back). The second floor of the castle has a balcony. Cut the tabs off your box, but leave the lid intact. Fold the box’s lid outward to create the floor of your balcony, then cut the floor to your preferred shape (we went semi-octagonal). Hot glue the second box on top of the first box. 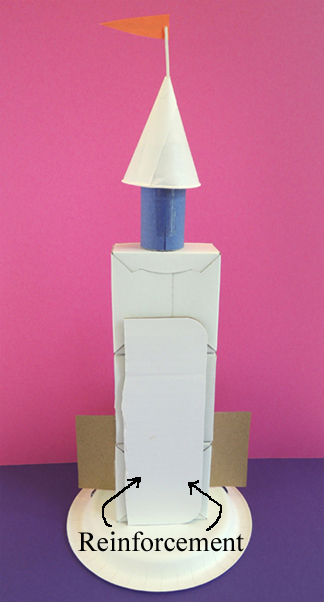 Then shape a piece of paper (or poster board) around the perimeter of the balcony to make a railing. Tape the railing in place. Furnish the second floor with a little table (a circle of tagboard (or poster board) and a wooden spool). Since the castle is tall and narrow, we decided it would be best to have the window wall open downward (as opposed to one side or the other – too tippy!). 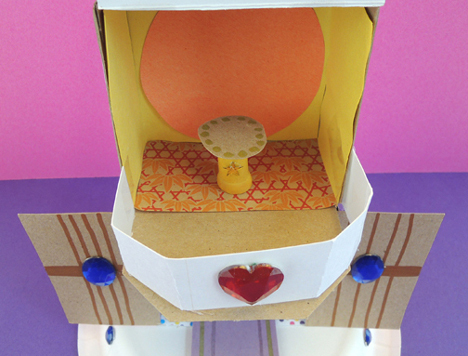 Below you can see how the wall folds down, revealing the interior of the bedroom and a paper baking cup bed. 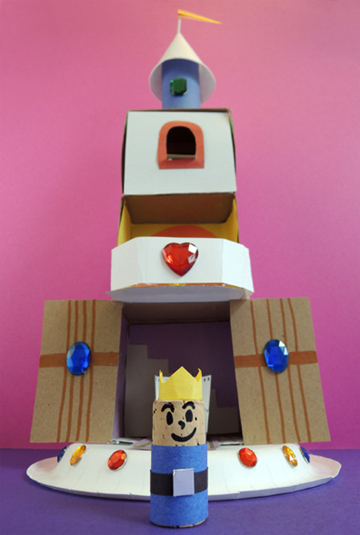 You can decorate the castle rooms before you glue the boxes together, or you can decorate as you build. 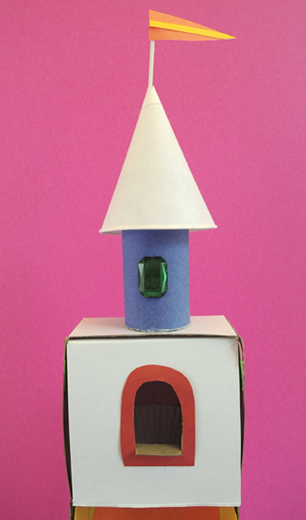 We offered construction paper, patterned paper, and plastic gemstones to our castle architects. And this! Gold flourishes on the tabletop and the white wall, echoing the Moroccan-influenced wall paper. Gorgeous. The pink shutters rock too. 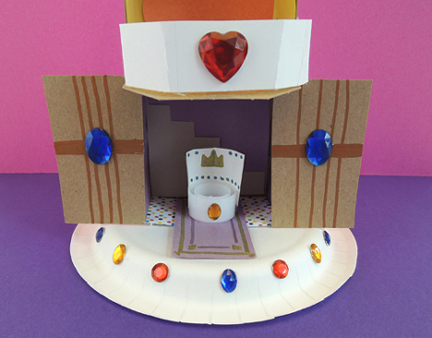 The last thing your castle needs is a king or queen! 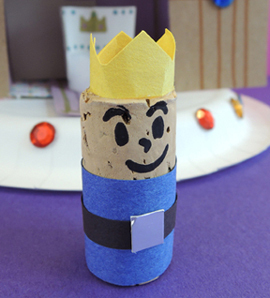 Used permanent marker to draw a face on a wine or champagne cork, then hot glue a little paper crown to the top. Wrap the remainder of the cork in paper. Done! 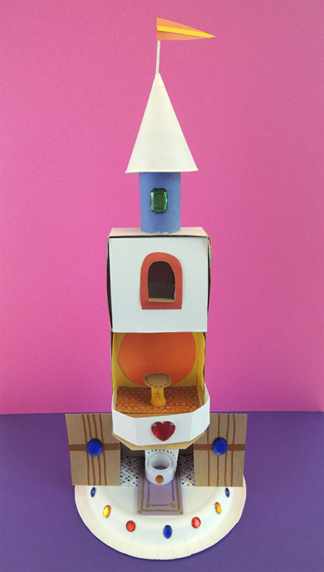 This entry was posted in Picture Book Projects and tagged activity, art, castle, children, craft, craft project, how to, instructions, kids, king, library, literacy, palace, royal, story time, story time project, storytime, Taro Miura, The Tiny King by Dana Sheridan. Bookmark the permalink.